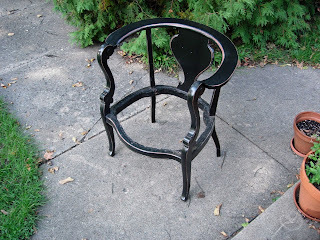 Here's a quick shot of a new (old) chair I picked up. I'm always a bit freaked out by the possible cooties in upholstery on vintage furniture, so that was pulled off & tossed immediately. Don't worry it was nowhere near original and was sloppily stapled on the bottom of a plywood board that was nailed on to replace the missing webbing. The paint is also not original - someone painted it and then took sandpaper to it to make it "shabby chic" (small gag). 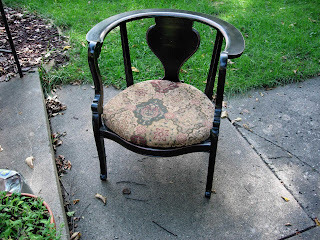 Imagine a cream chair with a pink & cream striped seat with piping. I know it is not a "bungalow" chair.....but it will work in my bedroom. Yesterday the copper drip edge fabricator returned my call. He drove out to my house and took a look at the installed drip edge. Much to my relief, he agreed that it wasn't exactly as it should be. The edge over the arch needs to be wider and completely cover all of the 1x2" wood trim and the ends of the arch need to have a bit more curve. It's tricky because this is an old house and the overhang was hand made over 80 years ago, so it is nowhere near precise. They are going to make a new arch and reinstall it. On a happy note, last night we had a rain downpour and the nice little diverter edge that they put at the top of the arch, efficiently directed the rain to either side of my front step. Well, I just got off the phone. I left a message for the drip edge fabricator. 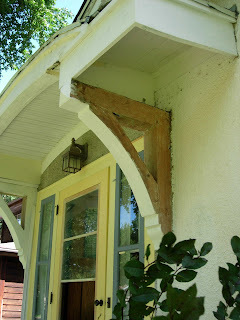 I've been out working on the entryway today and the arch of the copper overhang is just not what it should be. Yesterday, I mentioned wood trim showing out of the bottom of the coper in some spots. I had hoped a good night sleep would make that go away. While the new drip edge is miles better than the old snipped aluminum, today I came to terms with the fact that a fabricated drip edge (that I'm paying a lot of money for) should fit like a glove. This one doesn't. I asked the fabricator to come out and have a look - I suspect the installers will confirm what I'm saying. I just hope they handle this decently. So disappointing. I actually got off the phone and had a mini-cry. My new copper drip edge. The guys arrived to install it early this morning. About 1 hr. into the work, they knocked on the door and showed me some rot in the trim wood. Thank heaven last week I had thought to go out and buy some pieces of 1x2 cedar and prime them. So, they replaced the rotted sections with good trim. About 2 hrs into the install, I heard them out there quietly swearing. The arch of the overhang is nowhere near symmetrical....and the original pieces of wood were hand cut; some more rounded than others. So, they were out there trying to get the perfect arch of the fabricated copper to fit :-) In the end, they decided to go with the uniform arch, even if it meant that a small section of wood peeks out at the top of the arch. I can trim that wood when I paint, if I want to. The wood actually shows more in the photo than it does in real life - I think its because I'm shooting from below and the drip edge slightly sticks out at the bottom. The copper has a 1" rise that diverts the rain to either side when it runs down the roof - no more front door waterfall. The roofing guys are going stop back in a day or two to put in some flashing where the right overhang meets the stucco and to polish the copper (you can see their fingerprint smudges right now). It will take a couple of months before it starts to patina a golden brown. Hopefully this weekend is dry, so I can paint the overhang. Here's a reminder of where we started last summer. .. I almost feel a little silly posting this photo. The change is so minimal. 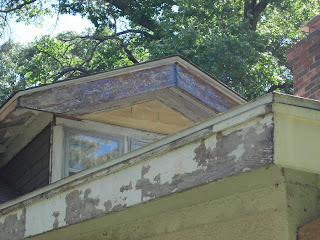 Last weekend I finished stripping, treating, priming & painting the bargeboard on my front dormer. To me it looks totally different and represents an entire weekend of my life. To readers, it may not look so impressive. Anyway, here it is. The painted dormer bargeboard. Try to ignore, for now, the window trim & the underside of the dormer soffits. The underside of the ends of the bargeboard are just primed and there is a 1x4 nailed on to the ends of the rafter tails. Eventually I'll pry that 1x4 unpainted board off.....and I'll also add the "rafter tails" back on to the bargeboard. They were cut off years ago when the aluminum was put up. The copper drip edge guy has (again) promised that the fabricated drip edge for the front overhang will be installed on Friday. He has fibbed ("lied" is such a harsh word) to me 3 times before and each time I was bitterly disappointed by his no-show, so I wouldn't bet money on it. But I think he knows how frustrated I am over how long this whole thing has taken, that this time he actually might show. Yesterday he left the phone message uber early in the morning on my work line telling me they would be here on Friday...I think he was avoiding talking to me directly because he knows this install has been long overdue. Anyway once the drip edge is installed, I'll move on to painting the already stripped & primed front brackets & overhang fascia. 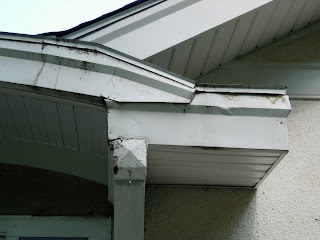 I'll also be able to finish stripping the fascia (showing in the above photo), that runs up the side of the overhang. In the meantime, I bought some colorful mums for my front doorstep. My theory is they minimize the ugliness elsewhere. I've been stripping paint lately. 83 yrs worth of old, lead paint uncovered when I yanked down the aluminum trim earlier this summer. The plan is to strip all of the exterior wood trim down to bare wood, treat with a borate, hit it with wood consolidator & wood epoxy where needed, prime, and paint. The method I found that works best for me is a heat gun at a low setting to take off the multiple layers of paint.....then a follow-up with Zinsser's Strip Fast to clean off the remaining residue. This has worked pretty efficiently. I like to deal with the lead paint for as short of a period as possible. The trade-off, is I work with a pretty strong chemical. 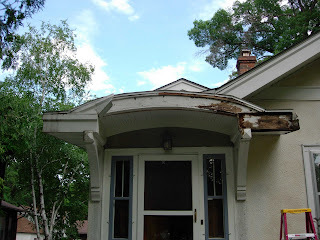 My hope is to have the dormer bargeboard/fascia and the remaining surfaces of the front door overhang brackets stripped, treated, primed and painted by the end of the month. 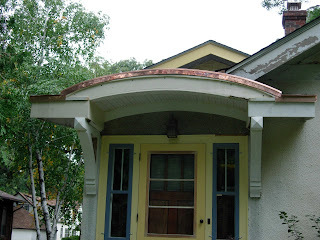 I'm using the same yellow paint colors that I used on my salvaged front storm door. You can see in the photos that I've already been able to paint the little triangle of shingles on the dormer. The wood above it has been worked on with a heat gun. It just needs a final clean-up. 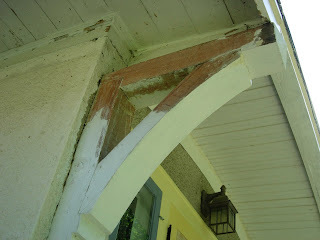 The interior surfaces of the brackets were stripped and primed last fall to protect them from the elements. It still amazes me how rock hard this wood is, with the exception of where the old aluminum trim allowed water to sit. Next summer I'll have to tackle the rest of the trim. Then I'll decide if I want to buy a Silent Paint Remover and, most likely, scaffolding. Oh, and I am still waiting for the copper drip edge to be installed. The latest promised is by the end of this week. We'll see. The "web designer" from Sydney, Australia that scraped & splogged my personal blog posts and presented them as his clients'.....in a pathetic attempt to get a higher position on the search engines........is STILL perusing my blog. It's sad when a house blogger that just wants to write about her house has to spend her time, instead, protecting her work from piracy. Get lost pal. You are not welcome here. The other day I was out in my living room quiety watching tv when I heard a really loud thump coming from one of the back rooms. I looked in each bedroom and then, finally, in the bathroom. 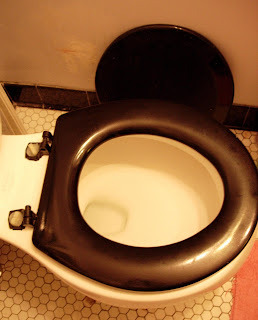 When I got to the bathroom I saw the toilet seat skewed to one side, the top was laying against the wall and the screw covers were scattered on the floor. This was a little odd because I was the only one in the house and had not been anywhere near the bathroom for quite some time. Evidently, the $8 plastic Home Depot bargain toilet seat had taken all it could and in a final, spontaneous act of desperation, flung itself to it's death on the cold, hard, hex tile. So, tonight I have been trolling the Kohler website for a more sturdy (and emotionally stable) replacement. Add one more item to the bathroom restoration list. Did you feel a slight shift in the cosmic universe last week? That was me registering for eBay. I put it off for as long as possible because, frankly, the possibilities kind of scare me. It seems a perfect mix of: no crowds, old house stuff, no driving, no store hours and a little healthy competition. It seems like something I could get drawn into. My first shopping item: a vintage, pink phone. I started by pulling up a sorted list of pink phones, and my heart beat a little faster when I saw a nice selection. I decided to start watching one auction. I wanted to see how people bid......kind of learn the ropes. 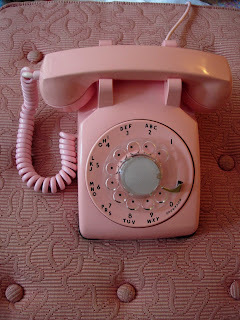 I had been doing a little research and knew....1950-60s pink phones were on the rare side. A nice pink - unfaded phone, original parts, in working condition sells for around $50-70 retail. The "test auction" was progressing nicely....then all of a sudden it went wild. The ending bid: $408. I was a little disheartened - was this one sale that got out of hand or was that the going rate? I watched a few more pink phones go at more reasonable bids. Then the phone of my dreams appeared. My strategy was The Last Minute Pounce. Ha! I got it :-) $23.50. $12 shipping. UPS took forever to deliver it. When it arrived it was a little dirty and this got me thinking. I didn't even know from where it came. Freaky. So, I pulled apart the entire phone and detailed it. I polished the little, interior brass bells. I even managed to correct a sticking in the dial rotation. You could now eat off this phone it's so clean. Sadly, this is the end of the great vintage phone binge of 2007. A little bungalow only needs so many phones.